A lot of ab exercises fall short when it comes to total core activation. Your core involves a lot more than your abs. Several muscles through your hips and glutes surround and stabilize your torso. This is your core. And the ab wheel is a simple tool that allows you to use the entire core to maximize your results. This quick and simple plan is all you need to use the ab wheel to level up your ab game. Find space on the ground to set up. You’ll want an ab wheel and a mat for your knees. When you set up, make sure you set up so that the wheel rolls on the floor, not the mat. Proper form is critical for both safety and maximum core development. The goal is to activate the core. But when done incorrectly, the ab wheel can put stress and strain on your back and hip flexors. 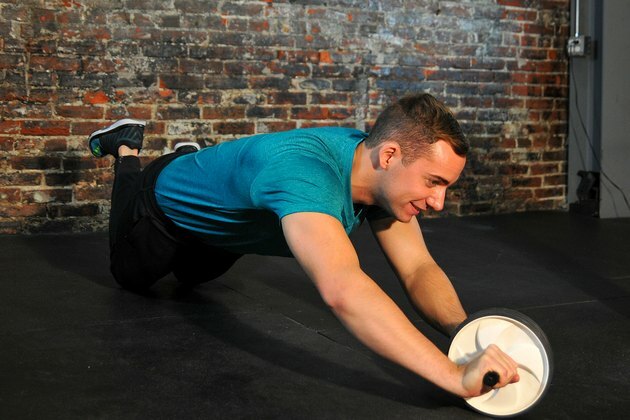 Setting up for using the ab wheel should look a lot like a push up from your knees. HOW TO DO IT: Grab the wheel with a double overhand grip, holding it underneath your shoulders. Keep a straight line from your shoulders down to your knees, meaning your abs are tight, not sagging. Squeeze your glutes and roll the wheel in front of your body, keeping your hips extended during the exercise. 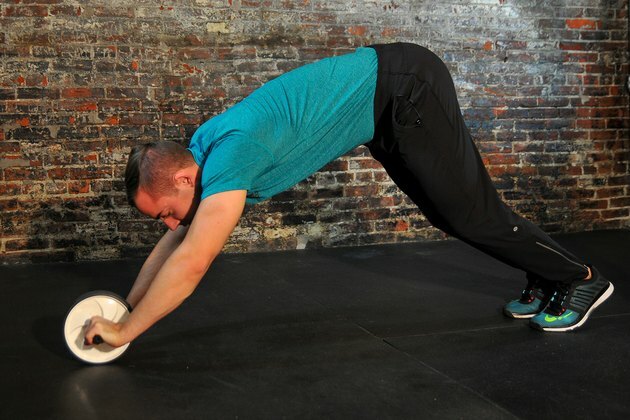 This ensures the focus stays on your core instead of the hip flexors. Keep your arms straight and your core tight as you roll forward until your nose is barely off the floor. Reverse the movement to return to the starting position. Complete three sets of eight to 12 reps.
HOW TO DO IT: Setting up is the same — knees on the ground, hips extended and elbows locked out with the roller beneath you. Keep your abs tight and extend your arms, rolling out diagonally until your nose nearly touches the ground. Roll back to the original starting position before rolling out in the opposite direction. Complete three sets of four to six reps on each side. HOW TO DO IT: Set up by standing with both feet on the floor and placing the wheel on the floor about a foot in front of you. Bend forward as if you were doing a toe touch to grip the wheel. 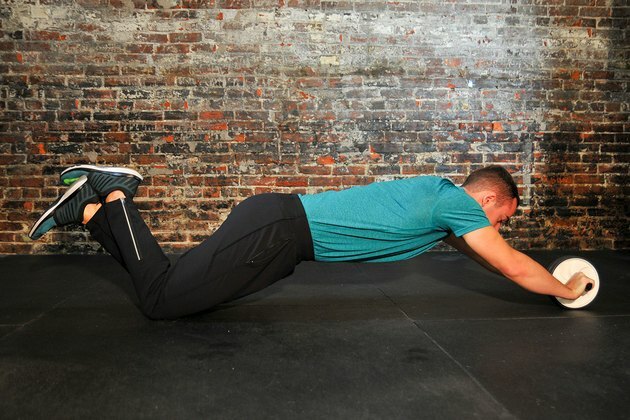 Roll forward into a push-up position and reverse the movement. Complete two sets of five to eight reps.
Take this move to the next level by rolling forward until your nose is barely off the ground. Buckle up, going deep on a pike roll out is no joke. Finish off your ab exercise routine with stretching your abs, obliques and back. Here’s a stretch for each. HOW TO DO IT: Laying on your stomach, push up onto your hands so that your torso comes off the ground. Keep the hips down to stretch your abs. Hold for about 15 seconds. HOW TO DO IT: Lie on your side and grab both of your feet behind you. You should feel the stretch in your hamstrings, hips and abs. Hold for about 15 seconds on each side. HOW TO DO IT: Laying on your back, bring your knees to your chest. Wrap your arms around your legs, as if giving yourself a bear hug. Roll from the top of your spine to the bottom. Perform five reps.
Ab wheels can be difficult. Only roll as deeply as you can with perfect form. When it comes to form, your hips don’t lie. Keep the hips extended to optimize core activation. As you get stronger, increase the number of reps or sets.